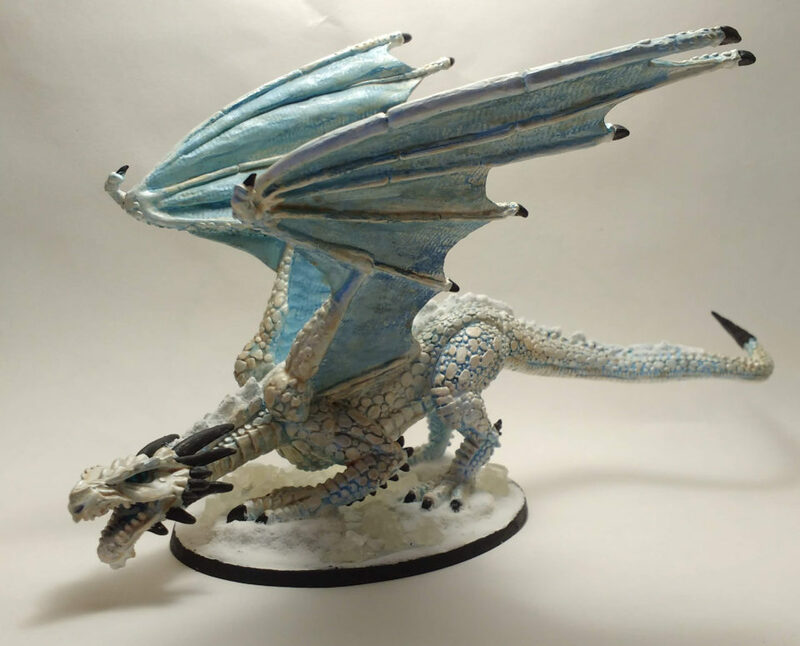 I purchased the Marthrangul Great Dragon miniature to enter in Michael Mordor’s May painting contest. Unfortunately May ended up being a terrible month on the work front – surprise resignation left me working some evenings & weekends – and I didn’t finish it in time for the contest… Oh well! I like entering these contests because they challenge me to take risks and try out new techniques. Mission accomplished. 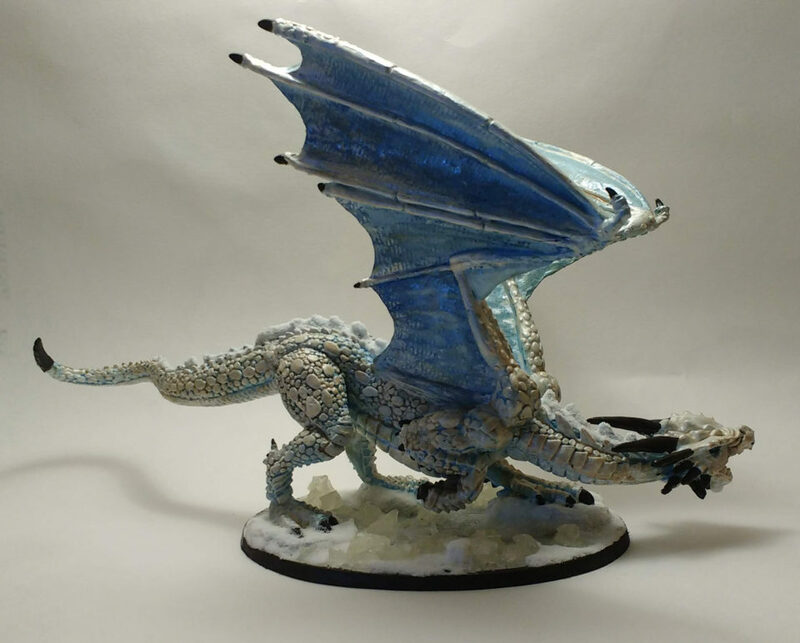 In any case, I decided to paint the Marthrangul Great Dragon miniature as a White/Ice Dragon. As noted I find Whites to be the second most interesting of the Dungeons & Dragons types, so it’s a bit sad that they’re overlooked as the weakest and rarely given much in the way of development. I’ve also been on an ice and snow kick lately thanks to my Celestial Winter campaign so painting Marthrangul as a White gave me an excuse to take that style up a notch. First, I loved the Blightfang sculpt so I was surprised to discover that Marthrangul surpassed it. This is a fantastic miniature that oozes character and can be taken in many directions. It’s also has a much larger “golden angle” than Blightfang – which will make it’s presence felt in tabletop. I’m not trying to bash on Blightfang, still had a great time with that one, just struck that there was an even better Dragon miniature out there! I did an undercoat of light blue followed by a second undercoat of metallic “ice blue”. Then I dry-brushed on many layers of white and metallic white. I painted the horns and claws metallic black to get in some contrast – it really changed the ‘feel’ of the miniature. I may go back and repaint them a dark silver instead, something that doesn’t pop quite as much, but for now I think they work well. There was a lot of detail work in other colors but the right highlight of this piece, for me, is the snow. I used Army Painter’s Battlefield Snow mixed with a bit of water and plain old Elmer’s glue. Initially, I mixed in too much water which resulted in the snow sagging and taking forever to dry. A less moist mix stayed in piece and dried very well. 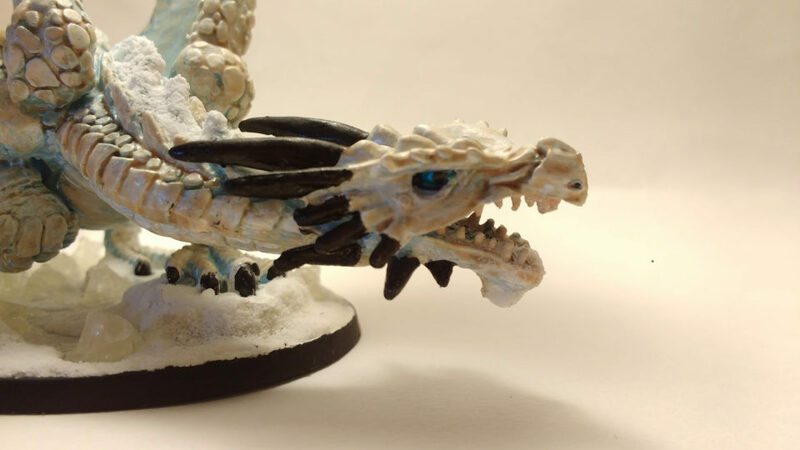 I frosted the dragon’s mane and mawl with snow as well as the base, to fun effect in my opinion. I considered placing even more snow on the dragon but I didn’t want to overdo it or distract from the sculpt. All in all… I’m very pleased with how this one turned out. I think the sculpt is fantastic and love the color scheme I went with. The base is also, in my opinion, by far the best that I’ve done to date. I foresee many fun encounters with White Dragons in my players’ futures.